Form is critical to a player’s performance at any club. However, when good form isn’t rewarded with adequate match time, frustration sets in. Despite possessing a potentially great set of players for the team, a competitive bench can prove to be equal measures vital as well as disastrous, as other clubs will be more than eager to lap up players if they are good enough. Such a situation seems to be brewing at Old Trafford, with Arsenal reportedly having asked the club to give the London side updates on Anthony Martial, who is seen battling with Marcus Rashford for a regular spot as a wide forward week in, week out. WATCH: What Martial Told To Ozil? The Frenchman has certainly been very impressive this season, despite having made few starts and redeeming most of his appearances from the bench, albeit providing great performances and having scored regular goals. Arsenal’s intention might also stem from the fact that Mesut Ozil and Alexis Sanchez may soon be out of contracts, and since the Red Devils are reportedly interested in the duo, the 21-year-old could potentially be thrown in as part of a swap deal. Arsene Wenger has reportedly been following Martial’s antics from the player’s days with Monaco, and will be more than eager to welcome him to the Emirates. 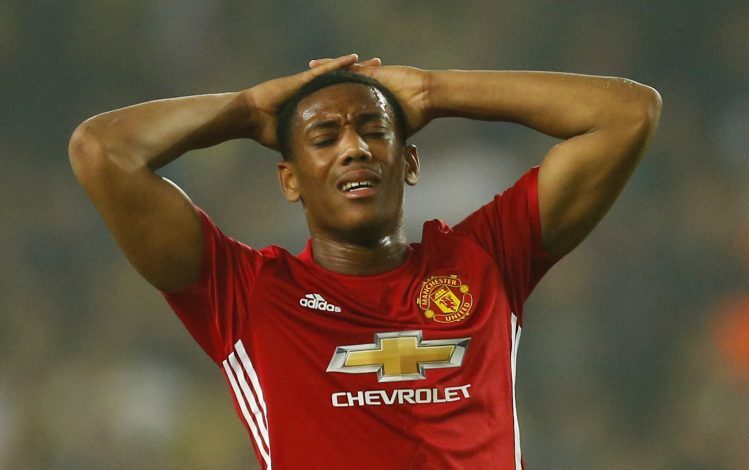 If Martial stays at United, he has the hope of impressing Jose Mourinho beyond measure, and eventually cement a starting spot. Whether or not the same can be said of Wenger is questionable.